Ideally situated in one of the best positions on Parque da Floresta, overlooking main pools and spa and close to clubhouse and restaurants. Our two-bedroom townhouse is fully furnished and equipped with all you need for a comfortable holiday home. Two outside terraces have dining furniture seating and shade umbrellas and the large top terrace has sunbeds with views of the golf course and sea. There are only two steps, with rails, in the whole house so it is very safe for children. The living room has a sofa -bed and two large armchairs and dining room furniture and patio doors to the bottom dining terrace. A woodburner and wall-fixed radiators provide heating, and a ceiling fan offers cooling breezes. The master bedroom has a king-size bed, fitted wardrobe with drawers and generous hanging space and a safe together with bedside tables and dressing table with drawers. The second bedroom has two full size twin beds and fitted wardrobe with drawers and ample hanging space and large chest of drawers. Both bedroom wardrobes have wardrobe heaters. A special sheet with built-in bed- guards is available for small children. Cots can be hired for babies. The two bathrooms are bright and modern: one has a full sized bath, his-and-her basins and shower, and the other has shower toilet and basin. Both bathrooms have heated towel rails and heaters. The kitchen is fully equipped with washing machine and dishwasher, and all necessary kitchenware, crockery glassware and utensils. 2km from the picturesque and sought after fishing village of Salema, with a safe, sandy beach, bars and restaurants. The beautiful unspoilt beaches and countryside of the Western Algarve are all within easy driving distance and offer opportunities for walks, biking, surfing and other water sports. Bathroom with bath, power shower over, twin basins, bidet, heated towel rail, heater and fan. 2nd bathroom with walk-in shower, basin, heated towel rail, heater and fan. Both bathrooms recently completely refurbished. Large open-plan living room with patio doors leading to ground floor terrace. 3 seat Sofabed and armchairs, dining table and chairs, sideboard, wood-burning fire. Heater/fan. The house has three terraces. The lower terrace has dining furniture and a smaller dining area on the mid terrace. The top terrace has 4 sun-beds with and views to the golf course and sea. On Parque da Floresta golf course. Beautifully landscaped 18 - hole par 72. Buggies and equipment hire available. Weekly club competitions for guests and members. 40% discount on green fees for guests. A very friendly club. Golf academy, driving range, short game area 3 putting greens. Junior tuition and competions. Other premier golf courses including Palmares, Boa Vista and Penina 15 minutes drive. There is in indoor spa at the pool (small charge payable) with sauna and steam room. There is also an indoor pool. Notes on accommodation: Townhouse arranged on one level with a few steps down to main living room and terrace. Suitable for children. Cots and high chairs can be hired from the resort. Outside: The 3 terraces face south and fairways and have sun all day. The two upper terraces have additional table and chairs with four sun-beds and sunshade. The bottom terrace has dining furniture for 6 and is furnished with pots of flowering plants. Overlooking main and children’s' pool, beauty spa and gym. 4 sunbeds on roof terrace, breakfast terrace and dining terrace with table and six chairs. Cleaning / Towels / Linen / Maid service: Towels and linen included (not beach towels). House prepared for arrival. Weekly maid service and linen change included. Extra maid service etc. can be arranged. Babysitting services can be organised by the resort. Extras (maid service) payable on departure. We’ve just stayed at the property for two weeks and had a brilliant time. 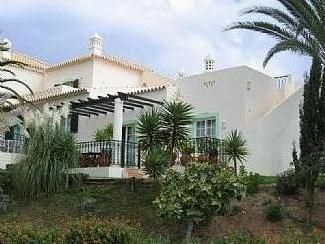 The location of the villa is ideal for the pool and SPA, just a 30 second stroll down the hill. Our two boys loved the pool, the golf and football coaching sessions. There was everything you could need at the villa and the box of beach toys available was much appreciated. We really enjoyed our week here. The owners were very helpful and friendly. The roof terrace was great but it is worth noting that the whole area is high up and pretty windy. Thank you so much for your kind comment. We always take our guests comments seriously and are in the process of installing wi-fi for our guests convenience. We loved our stay here. The house was clean, well equipped and just a 1 minute walk to the lovely pool. From this location we explored the surrounding coastline. After 10 days we feel we could stay for longer, which is a good reason for us to return. Children 13 and 9 loved the pool and surrounding beaches.. their only complaint was the absence of a table tennis table on the resort .. although we didn’t use the golf resorts activities they do offer activities for a small additional cost. We definitely recommend a stay here. Het huis is mooi, ligt prachtig en is zeer compleet, behalve dan dat de in de beschrijving genoemde wifi en airco niet bleken te kloppen. Dat waren, samen met een zwembad, de minimum-eisen die we stelden aan een huisje. Wat ons betreft dus een behoorlijke domper als 2 uit 3 niet klopt. In de slaapkamers en woonkamer waren wel vennen aanwezig. Voor Wifi moesten onze tienerkids naar de Spikebar, 5 min lopen. Als je iets in de omschrijving plaatst, zorg dan dat dat klopt. Wij hadden dit huis niet gehuurd als we dit vooraf geweten hadden. Heb je geen behoefte aan wifi en/of airco, dan heb je aan dit huis een perfect vakantieverblijf. Pretty beach of Salema 2km. Many other sandy beaches 5-15 minutes drive. All the beaches are very clean and sandy. Most have lifeguards and bars/restaurants and some have water sports available but deserted natural beaches can be found within 15 minutes drive. The lovely 7km long sandy beach of Meia Praia is 15 minutes away. Magnificent surfing beaches within 15-20 minutes drive west. Nearest villages are Salema 2km and Budens, adjacent to Parque da Floresta 10 minute walk. Lagos 20 minutes by car and Cape St Vincent 20 minutes drive. Faro is 100km and Lisbon can be reached by car in 2-3 hours. Spain is 120km and Seville takes 2-3 hours by car. There is a well stocked local supermarket in Budens (5 mins). Lagos has several large supermarkets and many shops, banks, a marina, many restaurants and bars as well as 4 beaches. Portimao has a large shopping centre and a retail shopping complex on the outskirts and a comprehensive shopping mall is to be found at Shopping Algarve at Guia. The resort has golf, tennis, bowls, archery and a beauty spa where all the latest treatments are available. There is a heated indoor pool with sauna, steam room and jacuzz. The well equipped gym offers fitness classes and personal fitness training is also available. A soccer school and other children’s' sporting activities and a kids' club for 3-14 year olds operates during school holidays. Horse riding for all levels is available locally and can be arranged through the resort. Boat trips and fishing trips can be found in Lagos. Bars and good restaurants can be found in Salema especially those specialising in fresh fish. Traditional cooking can be found locally and along the coast at the many beach bars and restaurants. For more variety and to suit late-nighters Lagos has many varied restaurants and bars to suit all tastes. Booking Notes: 25% deposit required. Remainder 6 weeks before departure. Changeover Day: Changeover day is flexible and arrival and departure times can be arranged to suit flight requirements. As our house is managed by the resort, key collection and 24-hour cover for breakdowns and emergencies is is available on-site. Notes on prices: Prices are for the property per week in UK Pounds.